Despite vehement official denials by trustees of any valuables being hidden in Sai Baba’s residence i.e. in the locked yajur mandir – to contrary has proved true.. and on an unimaginable scale too. See Midas hoard revealed was in Sathya Sai Baba’s private possession Lies, cover-up and deception by the Sathya Sai Central Trust have been proven time and again. Hardly a single important circumstance concerning the recent health, hospitalization, treatment, or the time and immediate cause of death of Sathya Sai Baba, has not been surrounded by secrecy, disinformation and ill-concealed controversy and power struggles between contestants for a role in the multi-billion dollar financed goings-on. This can be seen in a large number of newspaper investigations and statements from involved parties. Considering the huge controversy about his illness, about the amount of drugs he was taking for such a long period (some say 6 months) and the causes and manner of his decease, there should certainly have been a post mortem with a coroner’s report too, but no such process has been allowed. So far there is no mention anywhere of even a death certificate being issued for Sathya Sai Baba – surely a normal practice which is again being abrogated. 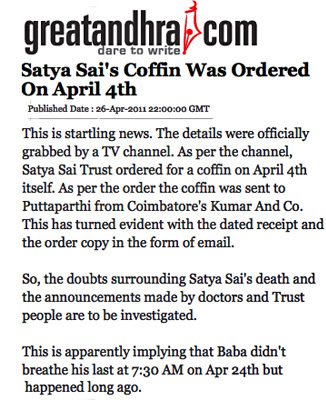 Perhaps the most sensitive issue for those involved in the continuing series of cover-ups reaching to high levels of government, is that of the date and circumstances of the ordering of his casket coffin – facts which Sathya Sai Central Trust blue-facedly denies, despite the documentation and full testimony on the extremely suspicious sequence of events being available on TV channels in India. That Sathya Sai Baba allegedly died on Easter Sunday is also suspicious because he was on a life support system which was removed at some point. This removal would have been tantamount to causing death. It was done to coincide with Easter Sunday – i.e. Christ’s supposed ‘resurrection’ day. This look very like an attempt to hang onto those foreign devotees who misguidedly believe that Sathya Sai Baba WAS Christ (including US Dr. Michael Goldstein – international chairman of the Sathya Sai organization – see him state this very short clip (filesize 260Kb)). Breaking news from Andhra Pradesh News here ….. My informant states: “A smart investigative reporter has tracked the matter down and managed to get actual email order of the embalming box that was asked to be delivered on April 4th…they are showing it on TV. The owner of the establishment has come on camera and admitted it with all the records. It looks as though Sathya Sai Baba was dead long back and serious development may even lead to calls for a post mortem and need to exhume the body?. Was he killed or did he collapse under the effect of drugs/steroids/pills?” This raises the question why the date of delivery was fixed about 17 days ahead of its appearance in Puttaparthi. Was it a precaution in case he should die, or a result of knowing he could not live, or even that he had already died.. or lost so many functions that he would be dead if any support were removed? The usual problem is the Sathya Sai Central Trust is a clandestine small enclave within the whole and no one but members have any ideas what is going on, if all of them do so even then. What is certain is that neither devotees nor even ‘ordinary’ Sai-VIPs have a clue about the acts behind the curtain or the facts below the carpet there! 1. Kumar International, Malleswaram, Bangalore, who are specialists in embalming/casket/undertaker funeral services got a request on or around the 29th March, for a special casket. The caller was one “Rajendra Reddy”…and he wanted to buy an air conditioned casket with embalming facility. 2. Ms Lakshmi, a middle aged lady, the owner of the service was surprised as most orders were only rentals for 2-3 days, mostly catering to the needs of people who die and whose relatives have to come from USA/UK etc ( of which there are plenty, given the thousands of Indian software professionals in South India who had migrated to the West ). The caller wanted a quotation and an email was sent to him. 3. The price quoted was Rs 57,000 plus Rs 5700 for transportation, the caller first said it should be delivered to Coimbatore city, and then said Mysore later. The price and details wee sent by Kumar International by email to “Rajendra Reddy”….who asked how long it would take to make one. 4. RR was informed it may take minimum a week , as per the specifications he had given, or alternatively, he could take a look at what they had in store.RR said he needed one within 3-4 days and had no time. He also asked how long the body would be preserved, to which Ms Lakshmi had said ” about 8-10 days,depending on the diseases/medication the deceased had been receiving. She was also asked about formaldehyde and she had replied that the doctors would be able to advise better, but yes, formaldehyde would be a good option. 5.Either RR or one of his agents had come to her office and paid a cash advance to her staff next day. And insisted that as they wanted a special casket immediately, they would choose one of those already in store. 6. Lakshmi’s staff started getting frantic phone calls by 3 AM on April 4th/5th….they had sent a complete price quotation for the special casket chosen by 4.41 pm April 4th ( the email was shown on TV ). 7. The casket was asked to be delivered to Puttaparthi hospital, which Lakshmi’s service did immediately. 8. Lakshmi, meanwhile ( although not a Sai baba follower ), started getting suspicious , as she had been following the Sai Baba news on TV. 9. But as nothing developed, she put it out of her mind…till Sai Baba was announced dead on April 24th morning. And by evening 6pm, when she saw the coffin/casket on TV, she was shocked to see it was the one she had sold and delivered to Puttaparthi on April 4th/5th. Even the name “Kumar International ” with contact numbers on the casket was seen on TV ( after the burial today morning, when the casket was kept to one side)…but even by Monday ( 25th) she was so concerned about what she should do, she consulted her family guruji and appraised him of the situation, and that this may involve the powerful Sai Baba.. The guruji simply asked her not to be afraid and advised her to speak the truth , irrespective of what it involved, as truth was the greatest protector. 10. Lakshmi, called TV channels in Andhra and went live on air, telling her full story, along with complete records to back up everything. This entry was posted on April 27, 2011 at 7:04 pm	and is filed under Cults, Gurus, India. You can follow any responses to this entry through the RSS 2.0 feed. You can skip to the end and leave a response. Pinging is currently not allowed.